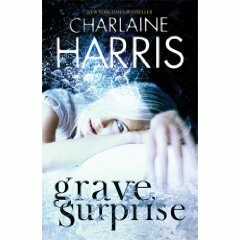 Grave Surprise by Charlaine Harris – It's Time to Read! A bolt of lightning struck Harper Connelly when she was 15, leaving her with a strange spider web of red on her torso and right leg, episodes of weakness, shakes and headaches – and an ability to find dead people. Harper is summoned to Memphis to demonstrate her unique talent, but there are still plenty of sceptics, even as Harper stands atop a grave and announces there are two bodies buried there. The police are convinced there’s something fishy going on when the grave is opened to reveal the centuries-dead remains of a man, which they’d expected (that being his grave, after all) and a dead girl, which no one expected – except Harper, of course. And suspicions are raised even further because Harper had failed to find eleven-year-old Tabitha Morgenstern when she was abducted two years before. Harper and Tolliver need to find the real killer to prove Harper’s innocence, especially after their nocturnal visit to the cemetery in hopes that Harper can sense something more is followed by the discovery, the following morning, of a third dead body in the grave . . . This is the second book in Harris’ Harper Connelly series – and pretty much as good as the first. There is a reason why I have only heard good things about this series – her writing is exciting and engaging; her characters are realistic and her storylines, and the suspense as they unfold are perfect. In this book, we travel from Saines to Memphis with Harper and Tolliver – her step-brother. She is going to give a demonstration of her ability to a group of university students. The old grave yard has a surprise in store for her though – in the oldest, darkest grave, is a recent body. The body, an 11 year old girl called Tabitha, who Harper had been looking for 18 months ago. Coincidence? Harper sets out to find out. Yet the grave has one more surprise for her. When she goes back, another new body is in there. How are the two related? What is the key? Alongside this, Harper learns more about the supernatural and has to struggle with her feelings for Tolliver. There is a lot to this book, yet it reads quickly. It is exciting, thrilling even. I was starting to think there was something deeper between Tolliver and Harper, so I am glad that has started to be explored. There are links back to the previous book, to allow the story to continue, and keeps other storylines open, such as the disappearance of their sister Cameron. I think that is important and very well done. I liked all the characters. All of them seemed believable. There are issues all of them face, and I like how Harris explores things such as grief and sexual orientation, as well as families and religion. I read this book in two sittings. You will not want to put it down – it is fabulous, a must-read.